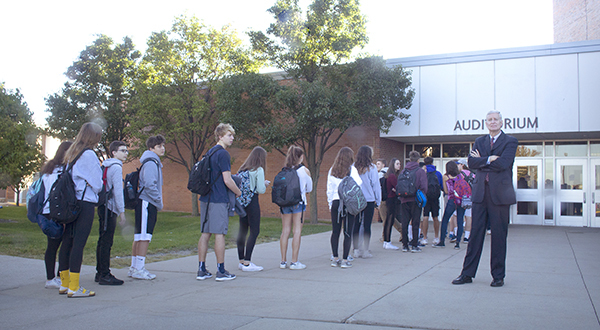 This school year District 225 and South administration have applied new safety changes in the building because of the intensified urgency for stricter security, according to school officials. Additional security measures were also implemented after two students reported finding a written warning on a desk in their classroom at 2:30 pm on Sept. 20 reading “there will be a school shooting on September 25th 2018”. The GBS administration notified students, staff and families of the incident through an email at 1:10 pm on Sept. 21 and, in the email, detailed the measures that GBS would take the following week and Homecoming weekend to ensure student and staff safety. These procedures included checking belongings at the Homecoming dance on Saturday Sept. 22, checking students’ belongings as they walked into school starting on Monday, Sept. 24 at all four entrances and increasing security around the school. The administration also searched all lockers at GBS on Sunday Sept. 23 according to another email sent on that day to students, parents and staff. 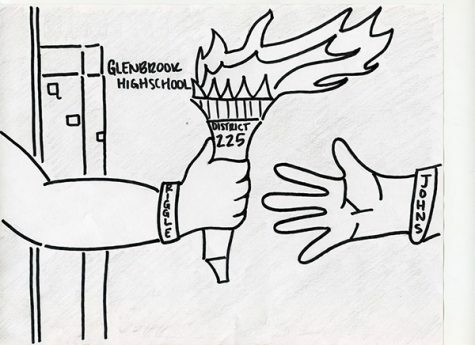 As of Monday, Sept. 24, the GBS administration and the Glenview Police Department have identified a 15-year-old student who has been charged with Disorderly Conduct for allegedly writing the school shooting threat on the back of a desk. At 5:30 p.m. on Sept. 24, the GBS Main Office sent out an email notifying students, parents and staff that they had identified the source of the threat through their investigation, and announced that all activities would continue as scheduled on Tuesday Sept. 25. However, according to Principal Dr. Lauren Fagel, 986 students did not attend school on Sept. 25. Increased threats to school safety around the nation in the past year have pushed the administration to implement new safety policies this school year, according to Fagel. The new security practices include color-coded ID lanyards for every adult in the district, an increased number of security guards at entrances, a revamped visitor check-in system and the hiring of a Safety and Security Manager for District 225, according to Fagel. The lanyards, blue/green for teachers, red for visitors and yellow for substitute teachers, in addition to the new policy that visitors must be buzzed in and provide a piece of government identification at the main entrance, were deemed important first steps in improving overall building security, according to Ronald Bean, GBS Dean of Students. 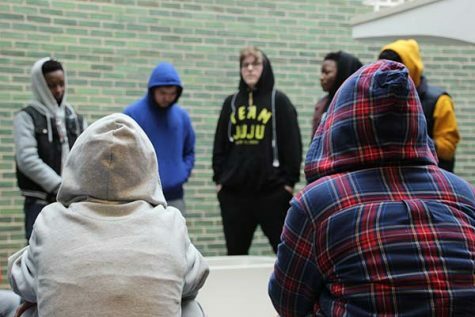 The new security measures were discussed by a newly formed group, the GBS School and Safety Committee, which consists of students, staff, local law enforcement and administration representatives, Fagel says. Input was also received through student and staff surveys which had the heaviest influence on which changes were made, according to Fagel. Ideally, Fagel says she would rather take less severe measures to protect students. 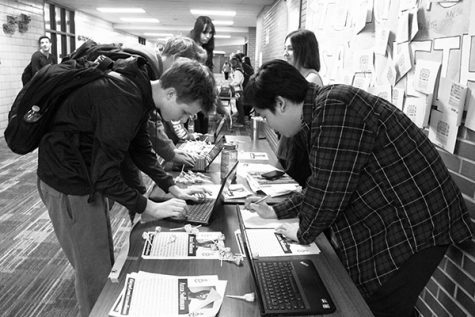 “I would struggle with the concept of metal detectors or clear backpacks [because] what I continue to learn is that the most effective prevention tool is to build strong relationships with students and adults and to encourage them to share concerns,” Fagel said. Another change implemented this year was a new position created by the District 225 School Board, titled Safety and Security Manager of District 225. Joel Reyes, former Northbrook police officer and Army veteran, was hired to fill this role. Reyes says his experience, desire to serve our community and passion for education made this position a perfect fit for him. Reyes says his responsibilities include overseeing all matters regarding safety, as well as providing input about ways Glenbrook South can enhance their safety and security practices. Reyes says that he is involved in deciding what changes will make all the district schools (GBS, GBN, off-campus and evening school) the safest they can possibly be. He believes that while large purchases, such as a metal detector for the front of the school, or bulletproof windows, may be necessary for some schools, South does not require such drastic changes. Reyes believes communication is the most effective way to create a safe environment. The budget for current and anticipated security measures was approved by the School Board, Casey Wright, associate principal for administrative services, says. “Last spring, the school board approved [$2 million] to be earmarked for security,” Wright said. Wright says more potential changes include security glass (some of which will have a bullet-proof glaze over it) surrounding the inside entrance of the building, concrete barriers and buzzers for the doors on the main entrance. In the future, a combination of impact-resistant and bullet-proof security glazing will be added to building entrances throughout the district. The cost of these enhancement projects is approximately $145,830. Bean says that students’ interests were at the forefront of his mind when discussing new changes. Junior Christie Chrones, one of two South students on the GBS Safety Committee, joined the committee after doing a service learning project about the Parkland school shooting for a class. Chrones says she feels that the security changes are worthwhile, but not a complete antidote for fear. Sophomore Elaina Maris believes that the changes made this year are beneficial to students’ well-being. Junior Henna Lee said that “[she’d] rather be safe than sorry, and other schools would have benefitted [from security changes],” in favor of the altercations. Fagel says that maintaining GBS’ culture was an important factor when considering the types of security measures. Fagel, Bean, Wright and Reyes all commented that South students also play an important role in the overall safety and security of the school. If students see any potentially dangerous or suspicious behavior they should report it through Text-A-Tip or the Titan Concern Center. “The biggest thing you can do is, when you get information, give it to someone who can do something with it, and can move forward to make sure we’re all safe,” Reyes said. All students in the Introduction to Journalistic Writing Class contributed to this story.